NASA astronaut Catherine Coleman (left), Russian cosmonaut Dmitry Kondratyev (middle), and European astronaut Paolo Nespoli (right), pose inside their Soyuz TMA-20 spacecraft at the Baikonour Cosmodrome in Kazakhstan. Coleman, Kondratyev and Nespoli are set to fly to the International Space Station on Dec. 15 to begin a long-duration mission aboard the orbiting laboratory. A Russian Soyuz spacecraft is poised to blast off fromCentral Asia today, carrying three new crewmembers to the International SpaceStation. NASA astronaut Catherine Coleman, Russian cosmonaut DmitryKondratyev and European astronaut Paolo Nespoli are set to launch today (Dec.15) at 2:09 p.m. EST (1909 GMT) from Kazakhstan's Baikonur Cosmodrome. 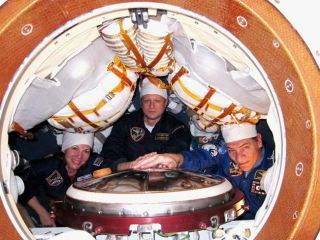 The triowill fly to the station aboard a Russian Soyuz TMA-20 spacecraft. During their long-duration mission, Coleman, Kondratyev andNespoli will participate in a range of scientific research and experiments, includingfluid physics, radiation, biology, technology demonstrations and educationoutreach. Cosmonauts Kondratyev and Skripochka are also scheduled to perform atleast one spacewalk to perform maintenance activities on the station'sexterior. The crewmembers will also be on hand for two space shuttlevisits ? the STS-133flight of Discovery in February 2011, and the subsequent STS-134 flight ofEndeavour, which is now targeted to fly in April. Discovery's liftoff wasoriginally planned for November, but technical issues with the shuttle'sexternal fuel tank have grounded the orbiter until at least early February. Catherine "Cady" Coleman was commissioned as asecond lieutenant in the U.S. Air Force in 1983, and was selected by NASA as anastronaut candidate in March 1992. She is a veteran of two space missions, andhas logged more than 500 hours in space. Coleman served as a mission specialist on the STS-73 flightof the shuttle Columbia, which launched on Oct. 20, 1995, and was the second UnitedStates Microgravity Laboratory mission. Then she was the lead missionspecialist on Columbia's STS-93 mission, which launched on July 22, 1999, anddeployed NASA's Chandra X-ray Observatory. "I've always wanted to go and live on the space stationfor as long as I can remember," Coleman told SPACE.com in a preflightinterview. "I had a 16-day experiment flight, and I didn't want to comehome. To understand living in a different kind of environment ? I think that ispretty cool to be a part of." Coleman recently celebrated her 50th birthday on Dec. 14 ? justone day before her journey to the spacestation. Cosmonaut Dmitry Kondratyev, 41, was born in Irkutsk, Russia,and rose to the ranks of colonel in the Russian air force. He was selected as atest cosmonaut candidate in December 1997 and qualified in 2000. From May 2006 through April 2007, Kondratyev served as directorof operations for the Russian Space Agency while stationed at the Johnson SpaceCenter in Houston. Today's spaceflight will be Kondratyev's first, and he willact as commander of the Soyuz TMA-20. Once onboardthe space station, Kondratyev will perform duties as a flight engineer, butwill take over as the space station commander for Expedition 27. "It will be one of the most exciting moments in my lifebecause spaceflight is something extraordinary and many people dream ofit," Kondratyev said in a preflight interview. "I will be very gladand proud." Throughout the mission, Kondratyev will also be occupiedwith various science experiments. "There are lots of experiments onboard the Russiansegment of the station ? environmental experiments, medical experiments,technological experiments," he said. "I will be a subject for some ofthem. It will help scientific institutions to develop things that are new andunique." European Space Agency astronaut Paolo Nespoli, 53, was bornin Milan, Italy. He joined ESA's European Astronaut Center in Cologne, Germany,in 1991, and was selected as an astronaut by the Italian space agency in July1998. In June 2006, Nespoli was assigned to the crew ofDiscovery's STS-120 flight, which was a mission to help assemble the spacestation. STS-120 launched on Oct. 23, 2007, and delivered the Italian-built Harmony(Node 2) module to the station. For this upcoming flight, Nespoli will serve as a flight engineerfor Expeditions 26 and 27.? "Our main goal there is to be available for carryingout experiments and use this laboratory that is up there and can let us dothings that we cannot do on Earth," Nespoli said in a preflight interview. "Most of our time will be spent in either being an operator or a subjectfor experiments." The six-person Expedition 26 crew will spend about threemonths together before Kelly hands over command of the station to Kondratyev.Kelly, Kaleri and Skripochka are set to return to Earth in mid-March, while Coleman,Kondratyev and Nespoli will remain on the station until May.